Mosaic tile wall in Daltile’s new Las Vegas tile and stone gallery. Daltile officially opened the doors to its remodeled showrooms in Denver and Las Vegas with special events. Both locations celebrated with grand opening events last week. Among the coveted showroom features is a slab yard attached to a traditional gallery setting at both locations, which provides a single-source resource for local architecture and design communities. Multifunctional workspaces, tile libraries, hospitality areas and conference rooms have been remodeled with design professionals and clientele in mind. 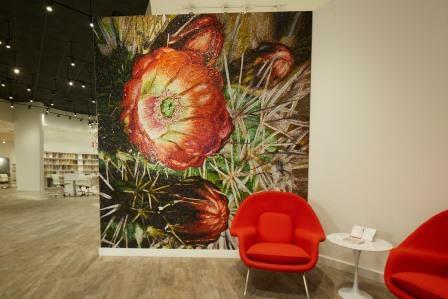 In Las Vegas, the 5,800 square-foot tile and stone gallery, visitors are welcomed into the space by a floor-to-ceiling desert cactus mosaic mural that reflects the central Las Vegas location. Exploring the space, products are artfully displayed on floors, walls and partitions. Further, a loose tile library provides customers with full-size samples to help match and coordinate styles for their projects. Also, an LCD touch screen lets customers virtually flip through the digital catalog, view inspiration gallery images and create designs with the tile and stone visualizer tool. The space is accented with a custom chandelier made with tile pieces, bringing further inspiration for guests. The hospitality area features a diamond-matched Aqua Marine Granite backsplash and bright white Morning Frost ONE Quartz countertops. A more intimate space for designers or architects to consult with clients is provided in the modern conference room showcasing a striking slab tabletop. Moreover, connected to the open, bright showroom is an expansive slab yard housing hundreds of slabs for selection from exotics, to granite and quartz. This allows designers to utilize the space as a multi-faceted hub for tile and stone specification. The Las Vegas Tile & Stone Gallery, located at 3345 W. Sunset Road, Suite G, hosted a vintage Las Vegas themed grand opening event on Aug. 3, 2016, to celebrate the new space. 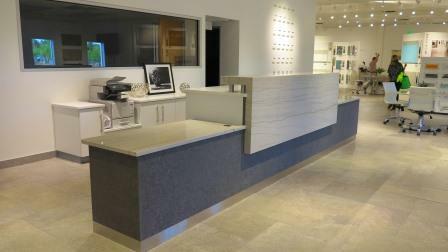 In Denver, the 4,700 square-foot tile and stone showroom features an entry area with a large stone slab desk with waterfall accent . An accompanying fireplace vignette featuring four book-matched slabs warmly welcomes visitors and showcases the striking stone slab offerings. Also, an adjacent slab-yard and neighboring Mohawk carpet showroom creates a holistic experience conveniently located in the heart of Denver. The Daltile Denver Showroom, located at 852 S. Jason St., Unit 8, hosted a “Colorado Local” themed grand opening event on Aug. 4, 2016 to celebrate the showroom remodel. Of course, for more information about the breadth and depth of Daltile product and retail offerings, please visit Daltile.com.